Although I had to deal with some car issues throughout the morning I managed to squeeze in some birding between appointments. 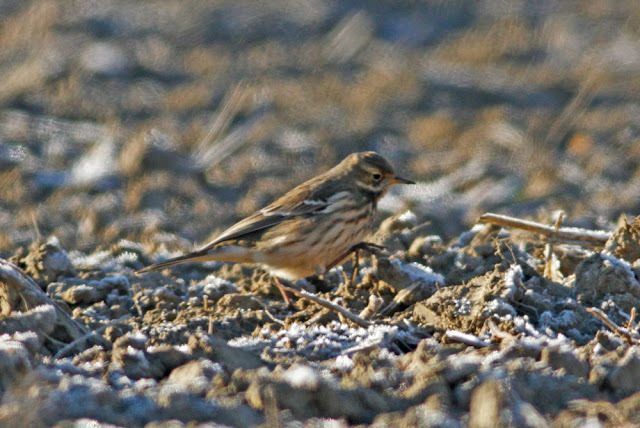 It was cold and blustery with winds in the NW quarter and there appeared to be plenty of birds moving. The morning got off to a great start with a tight flock of 11 Gadwall among the Canada Geese at Barton Cove though little else was present and last night's Bonaparte's Gull had already moved on. 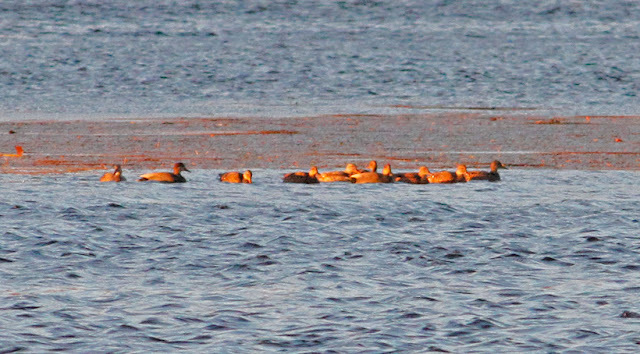 Gadwall - 11 birds, Barton Cove, Gill Franklin Co., MA. October 30th, 2015. The largest single flock of Gadwall that I've encountered in Franklin County. While my car was being worked on, I picked a spot off Route 2A in Greenfield overlooking an old sandpit. Although my view to the east and south was blocked, I had a decent amount of horizon to the west and north, and soon noticed large flocks of American Robins moving SW, along with some Cedar Waxwings (55), Red-winged Blackbirds and Common Grackles. 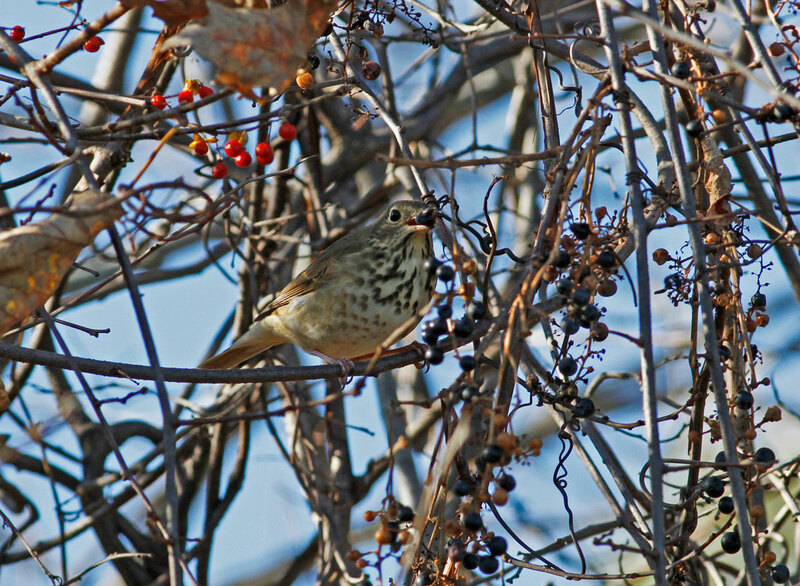 Scarcer species included a party of 3 Rusty Blackbirds and 2 calling Evening Grosbeaks. 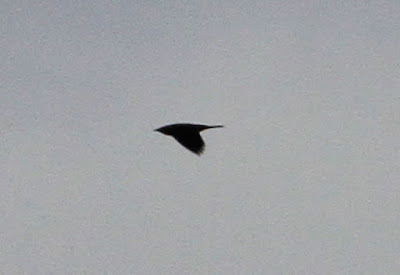 Rusty Blackbird - one of three moving SW over Route 2A in Greenfield, Franklin Co., MA. October 30th, 2015. Token record shot. 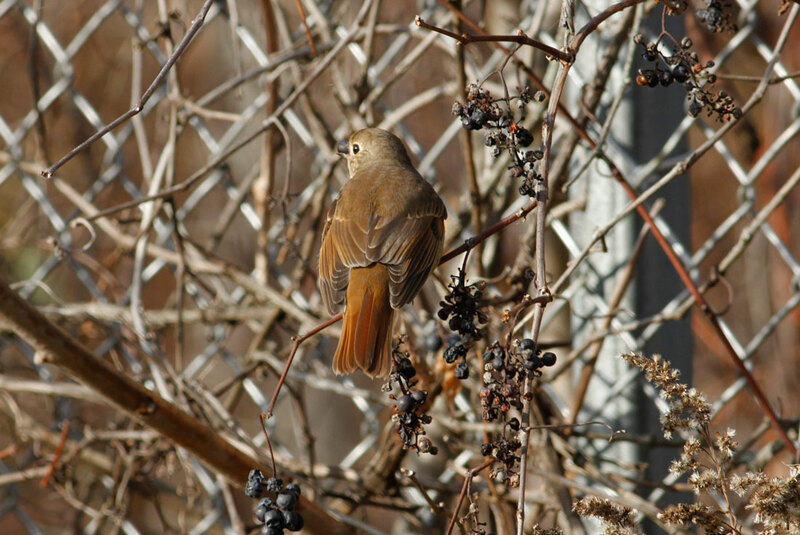 The other two birds appear in the same frame but couldn't be squeezed into this heavy crop. 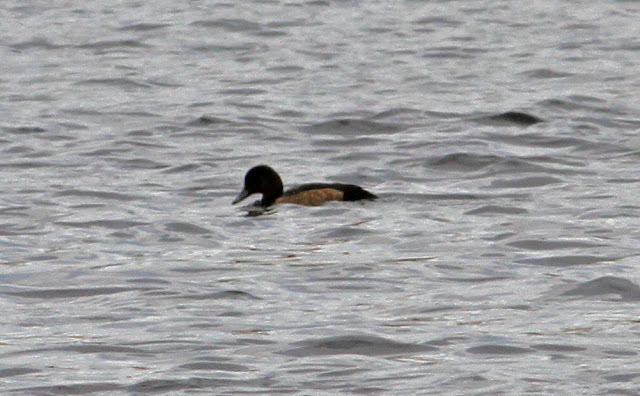 Greater (left two birds) and Lesser Scaups - Turner's Falls power canal, Franklin Co., MA. October 30th, 2015. Meanwhile, at Turner's Falls, a flock of 18 Pine Siskins flew straight over Avenue A in downtown Turners in mid-morning, and the 2 Greater Scaup continued at the power canal, this time joined by the long staying Lesser Scaup. 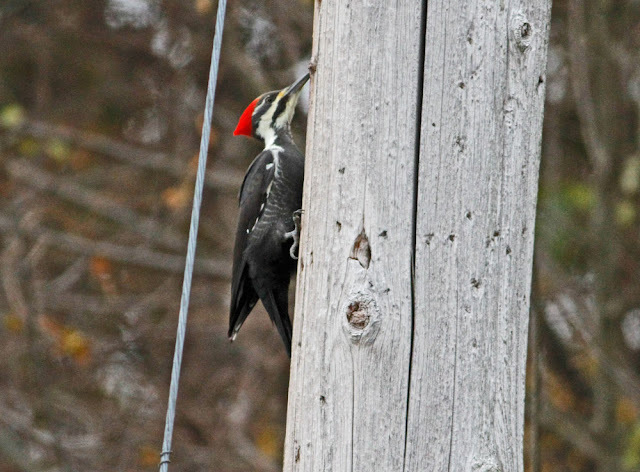 Pileated Woodpecker - two different individuals, Turner's Falls power canal, Franklin Co., MA. October 28th, 2015. With a few minutes to kill before an appointment at nine, I pulled up at the Turner's Falls power canal at one of my usual spots. 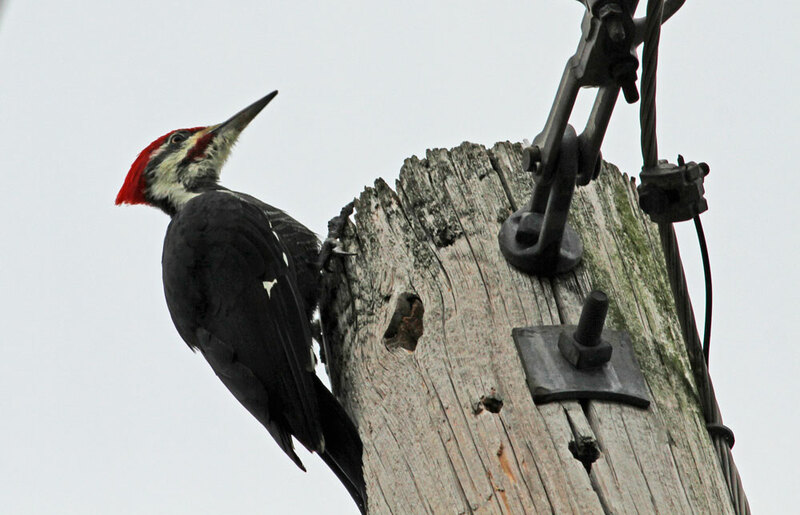 Slap-bang on the utility pole in front of me was a super Pileated Woodpecker! Hardly believing my luck I slowly opened the car door and snapped a pic before it shuffled around the pole and became more difficult to see. Then I heard a second Pileated and looked up to find another perched on the utility pole behind me.....not too shabby I thought! The first Pileated continued to work the original utility pole and then something additional caught my eye......atop the exact same pole was super Merlin, seemingly totally unconcerned by my presence. Within seconds the Merlin took off to pursue a small group of Cedar Waxings that flew in to feed on wild grapes - a pretty 'sweet' cameo of species at close range! Merlin - Turner's Falls power canal, Franklin Co., MA. October 28th, 2015. 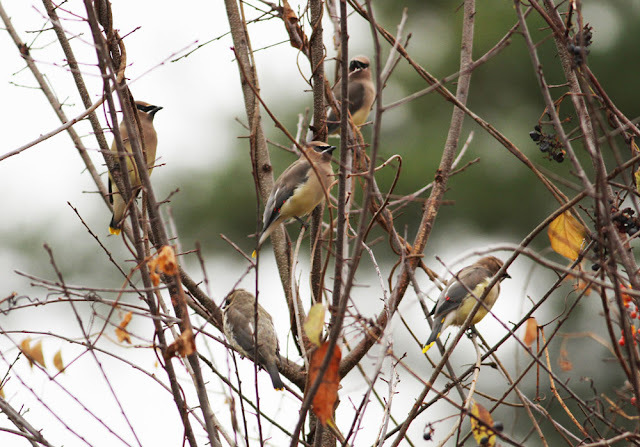 Cedar Waxwings - Turner's Falls power canal, Franklin Co., MA. October 28th, 2015. 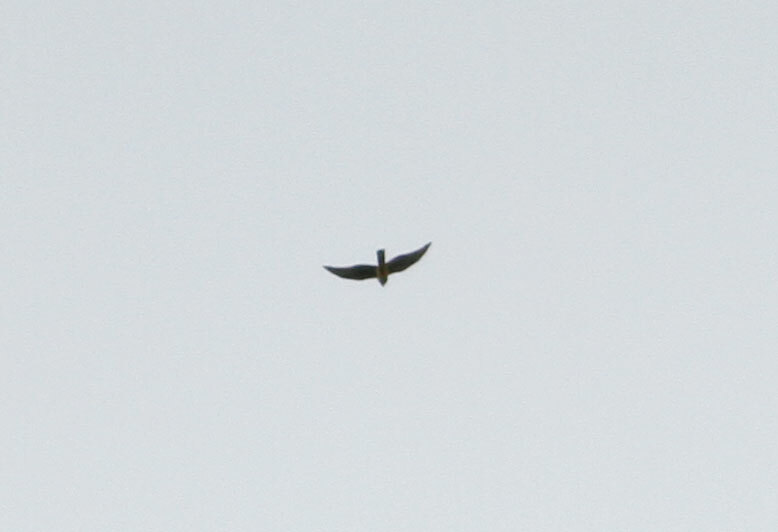 Good numbers of these in small groups scattered along the fringes of the power canal, about 40 in total. By mid-morning, rain and showers set in for the day and continued heavily through the night with some thunderstorms in the mix, apparently the remnants of Hurricane Patricia. As so often with these weather events, expectations were raised for some wind-blown waifs but it wasn't to be. In fact, a quick spin around Turner's Falls in the morning found it to be incredibly quiet though pleasantly warm and windy. 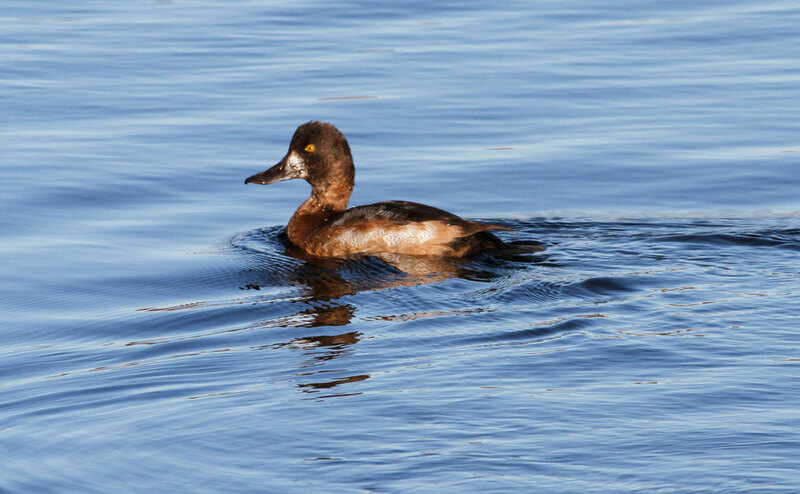 The afternoon was better with the power canal producing two Greater Scaup while the Lesser Scaup continued, and three drake Common Goldeneyes were also present. 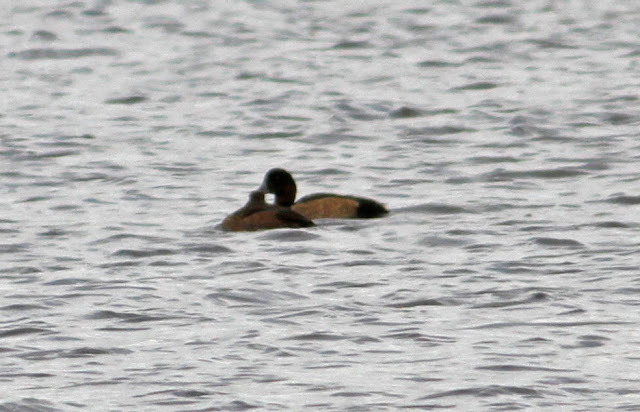 Greater Scaup - first-winter male and female, Turner's Falls power canal, Franklin Co., MA. October 29th, 2015. Fresh arrivals and my first of the season. Lesser Scaup also present but not associating with these guys. 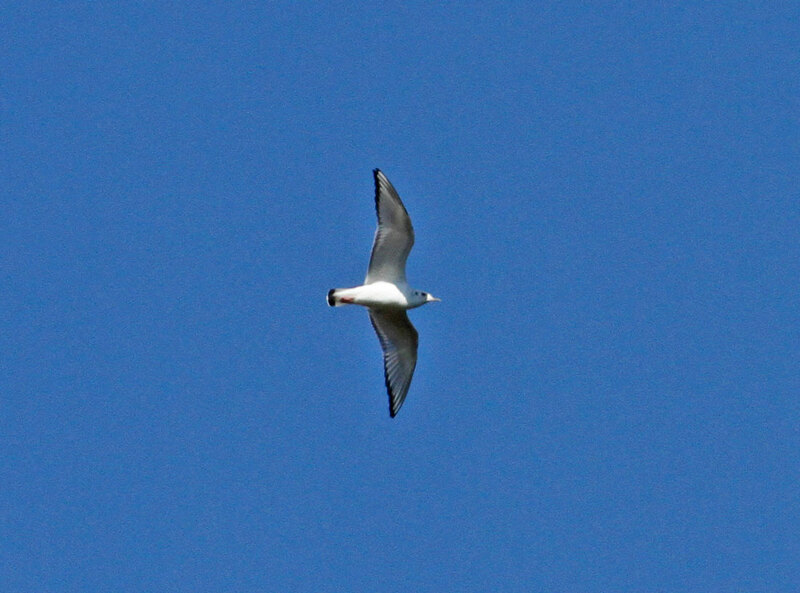 Bonaparte's Gull - adult in winter plumage, Barton Cove, Gill, Franklin Co., MA. October 29th, 2015. 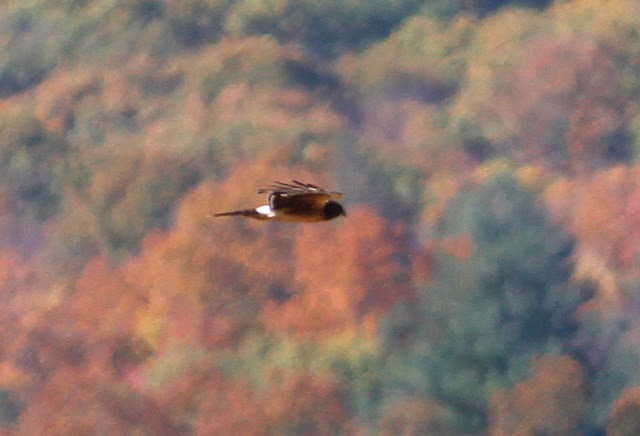 Image taken from Unity Park, Turner's Falls, thus distant and very grainy. Gull diversity is picking up with up 43 Ring-billed and 7 Herring Gulls seen this week. Bonapartes are far less usual here. 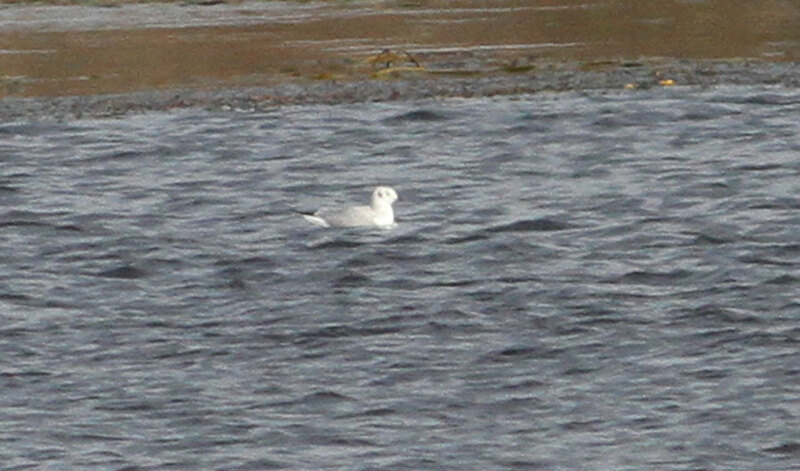 At Barton Cove, an adult Bonaparte's Gull was a nice end to the day and had likely dropped in sometime during the afternoon because I certainly didn't see it on the morning rounds. Calm sunny days prevail though often starting with a chilly, frosty start. Considering how good late October can be we seem to be having a lull in migration and the last few days seem to have been very quiet indeed. 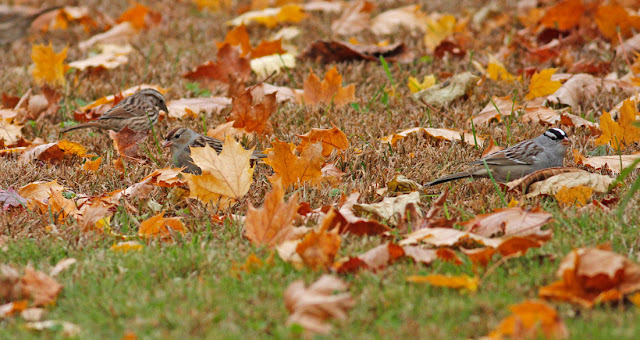 Small flocks of Pine Siskins continue to migrate through having started last week, along with a handful of Purple Finches in Gill and Turner's Falls. Hermit Thrushes are passing through in small numbers with concentrations of 3-4 birds at North Cross Road in Gill, Turners Falls airfield and Turner's Falls power canal, and I continue to find Winter Wrens, mostly roadside birds in Gill but also in odd locations such as behind my local bike store off Route 2A in Greenfield. Hermit Thrush - first-winter, Turner's Falls airfield, Franklin Co., MA. October 27th, 2015. One of at least three at this location. 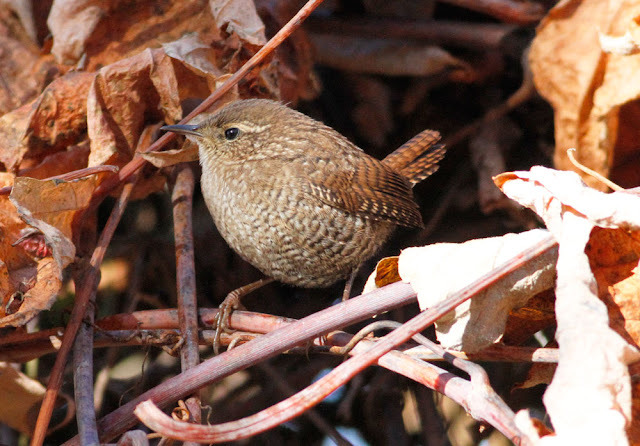 Winter Wren - off Route 2A, Greenfield, Franklin Co., MA. October 25th, 2015. Waterbirds seem to have been extremely thin but the long staying Greater White-fronted Goose was still present at the power canal on Oct 25th, a single a American Coot at Barton Cove to the 25th, and then my first scaup of the season on the 26th, and the first Common Goldeneyes of the fall on the 27th, both at the Turner's Falls power canal. Slightly more surprising was a lone Greater Yellowlegs at Barton Cove on the 27th, a bird which I may have heard briefly last week in a fall that's been rather poor for shorebirds in the Turner's Falls area. 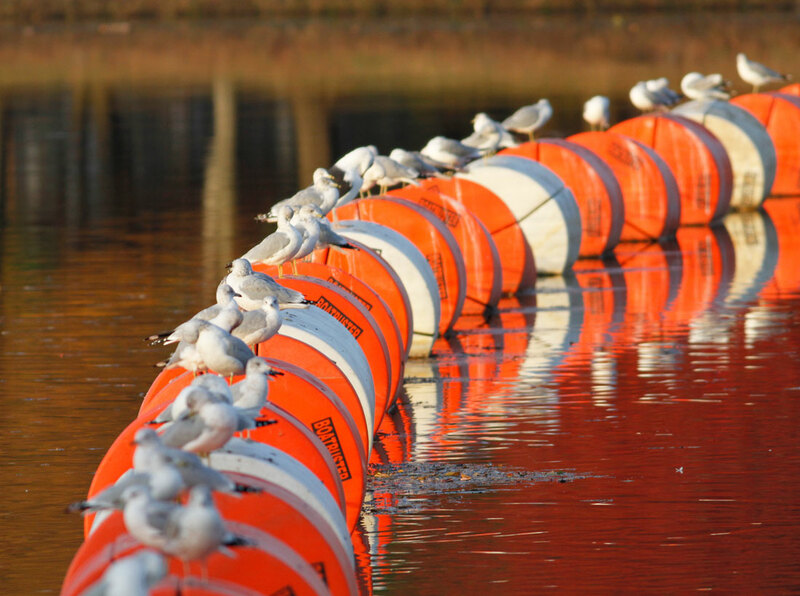 And in a sudden arrival this evening (October 27th), Ring-billed Gulls are back in numbers (43) after no more than seven birds together all autumn. 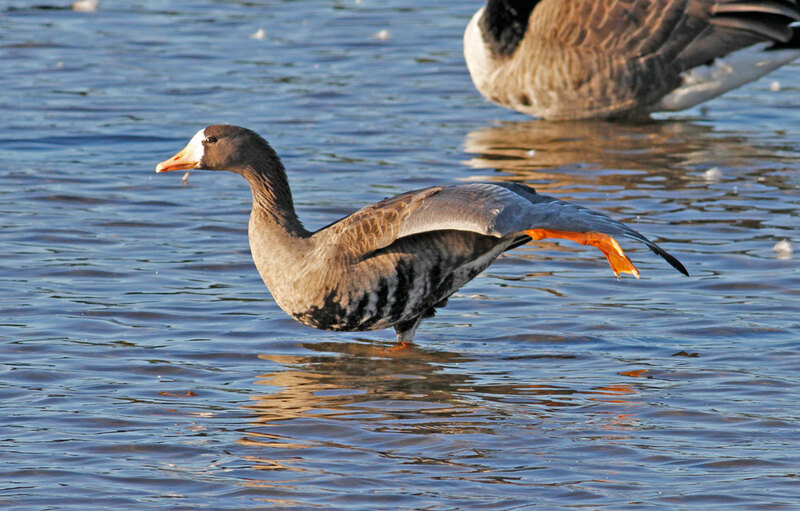 Greater White-fronted Goose - adult, Turner's Falls power canal Franklin Co., MA. October 25th, 2015. Lesser Scaup - non-breeding male, Turner's Falls power canal Franklin Co., MA. October 26th-27th, 2015. Common Goldeneye - males, Turner's Falls power canal Franklin Co., MA. October 27th, 2015. First of the season here. Greater Yellowlegs - Barton Cove from Turner's Falls, Franklin Co., MA. October 27th, 2015. Possibly in the area since October 22nd when I heard one 'burst'; of Greater Yellowlegs call at Unity Park. 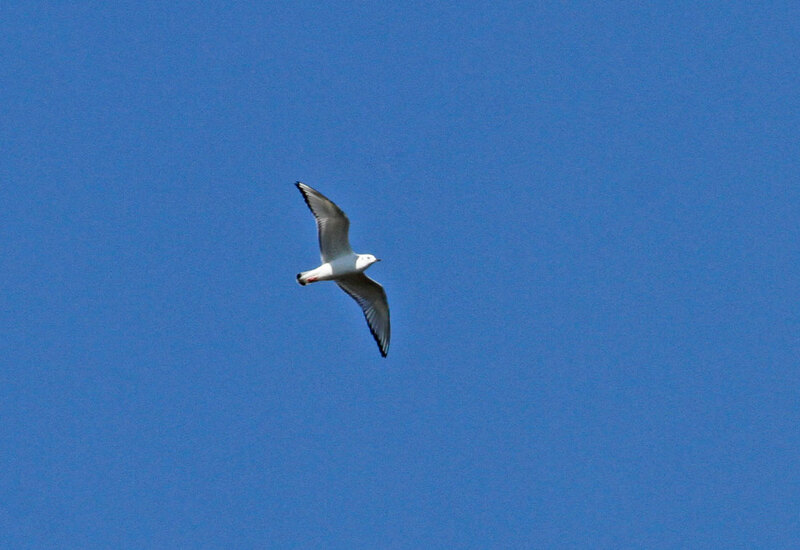 Ring-billed Gulls - from Unity Park, Turner's Falls, Franklin Co., MA. October 27th, 2015. Back in numbers after a sudden mass arrival this evening. 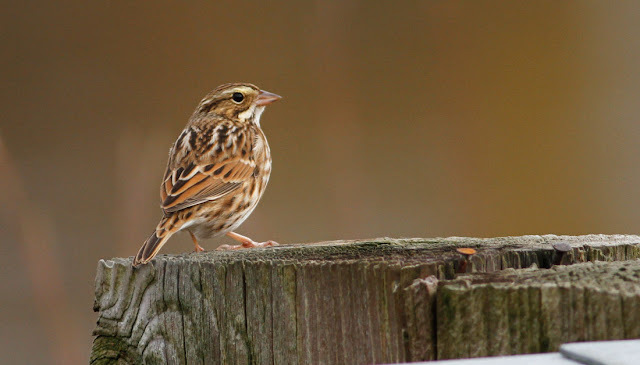 Savannah Sparrow - Turner's Falls power canal Franklin Co., MA. October 25th, 2015. Very common migrant at this time of year. Almost anywhere with grassy or weedy fringes can support them. This was one of about a dozen along the roadside at the power canal. Mild south-westerlies had produced a bit of lull in migration until today's cold front stirred things up a bit. Nothing over dramatic but the first 'mini-arrival' of Buffleheads including a female with 3 Hooded Mergansers at Barton Cove and a pair with a further 7 Hooded Mergansers at Turner's Falls power canal. 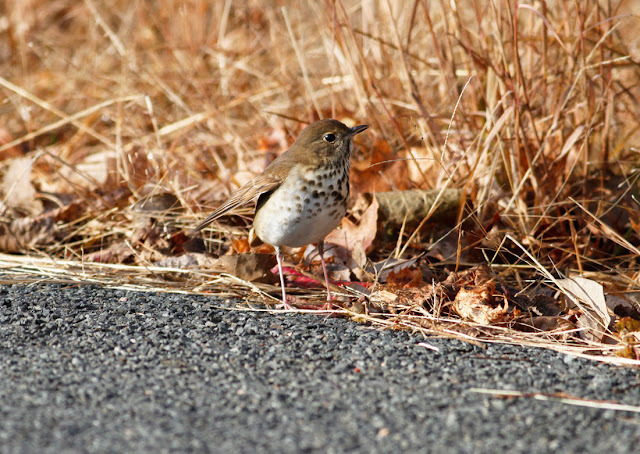 A Hermit Thrush was also a nice find at the power canal. 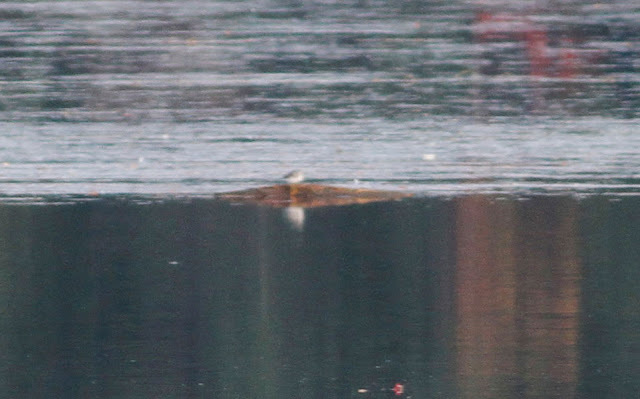 The long staying American Coots (3) remained at Barton Cove along with a Pied-billed Grebe. For me though, the highlight was a Black-throated Green Warbler that brought a nice splash of color to feeding a flock of titmice and chickadees on Riverview Drive overlooking Barton Cove. Bufflehead (center) - female with Hooded Mergansers, Barton Cove, Gill, Franklin Co., MA. October 23rd, 2015. 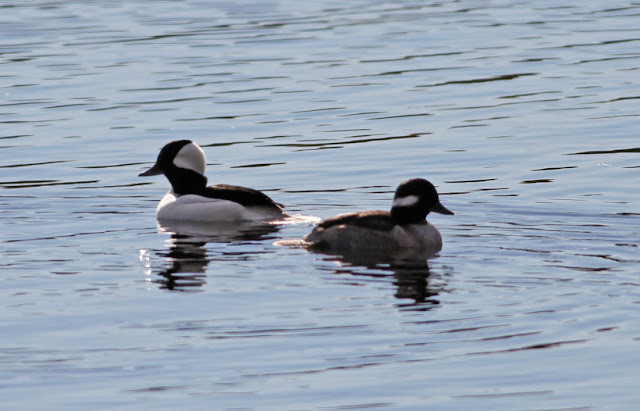 Buffleheads - male and female Turner's Falls power canal, Franklin Co., MA. October 23rd, 2015. 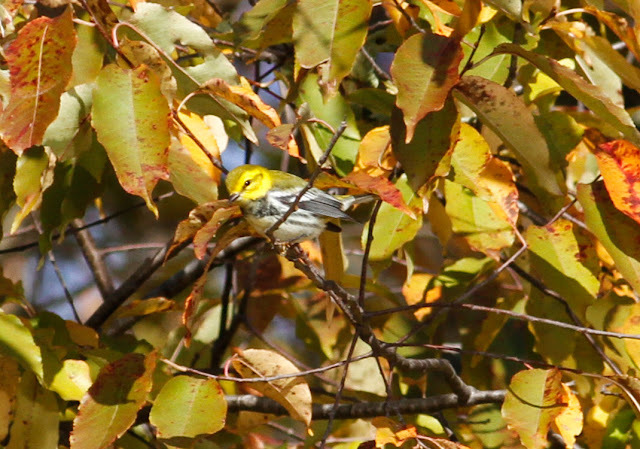 Black-throated Green Warbler - Riverview Drive, Barton Cove, Gill, Franklin Co., MA. October 23rd, 2015. 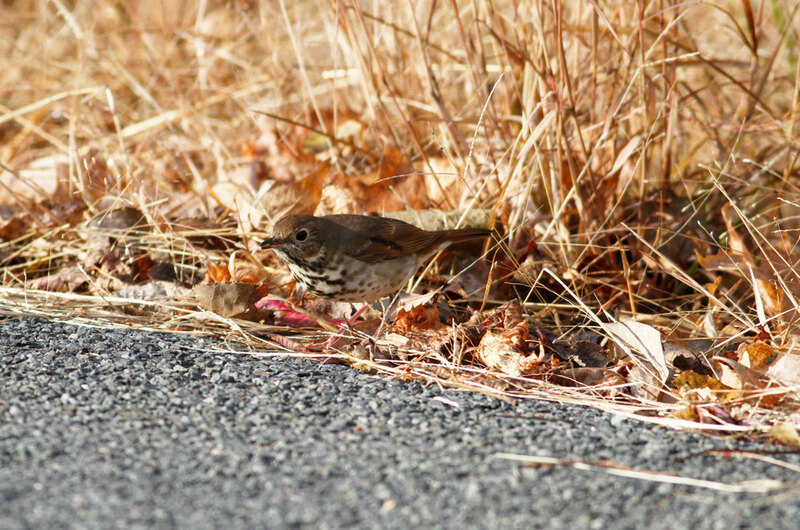 Hermit Thrush - Turner's Falls power canal, Franklin Co., MA. October 23rd, 2015. Later in the morning I headed down to Montague to follow-up on a Vesper Sparrow that I pushed up from the roadside whilst riding my bike on South Ferry road. 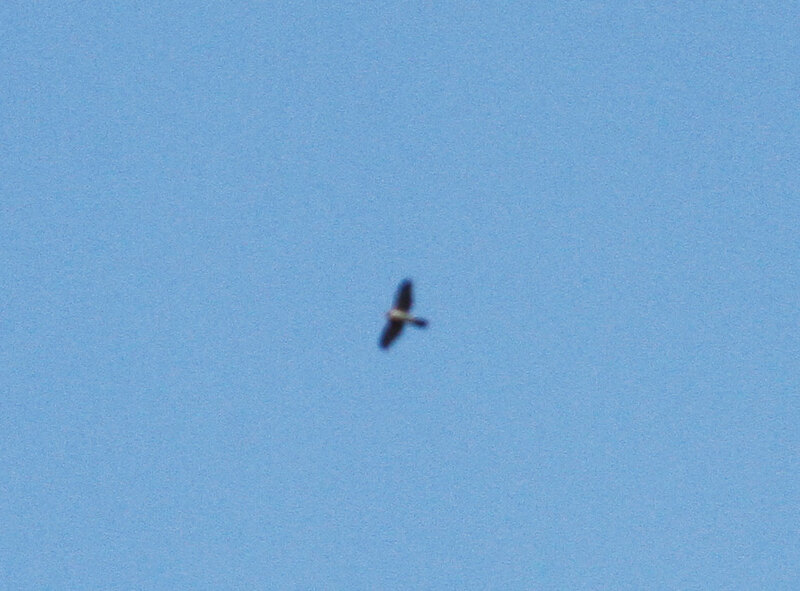 Eventually I re-found it but it wasn't easy in the blustery north-westerly winds and a number of Savannah Sparrows complicated things a little more, so no pics of that one unfortunately. 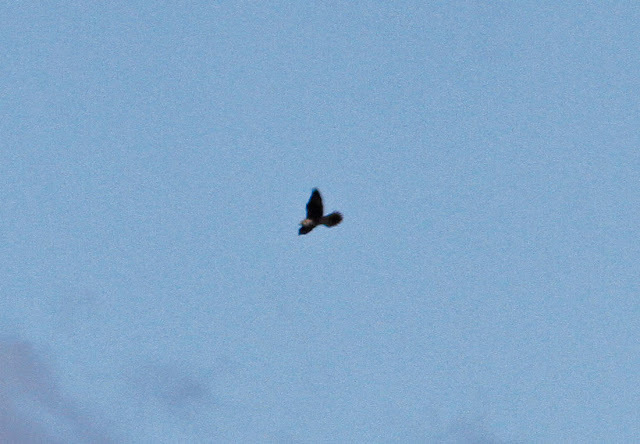 The raptor watching however, was impressive and after an hour I'd notched up Northern Harrier (juvenile), North Goshawk (adult/sub-adult), Bald Eagle (adult), and a Peregrine (juvenile). The latter succeeded in pushing up a flock of over 100 American Pipits, birds which I would have never seen without the Peregrines help! 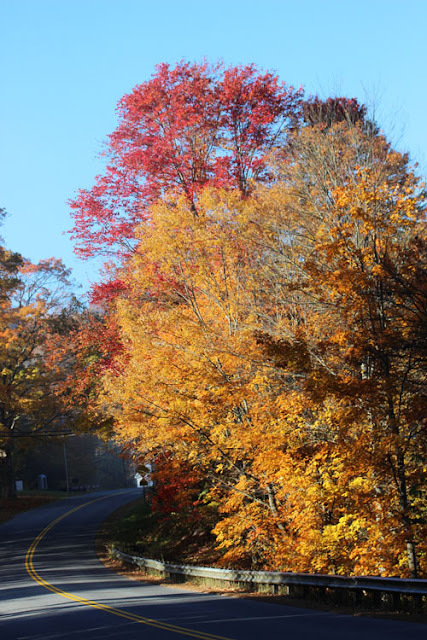 South Ferry Road also proved to be a fine spot for tallying the spiraling Ravens over the Deerfield Ridge to the west - at times as many as 50 Common Ravens were playfully sparring above the ridge, a phenomenon which I see every year in late fall. 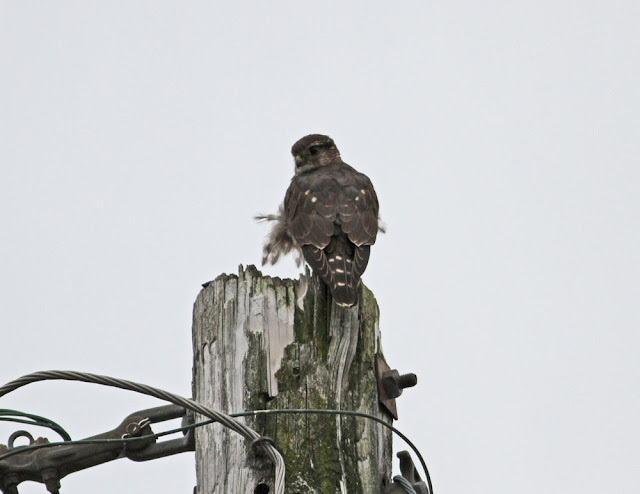 Northern Goshawk - South Ferry Road, Montague, Franklin Co., MA. October 23rd, 2015. 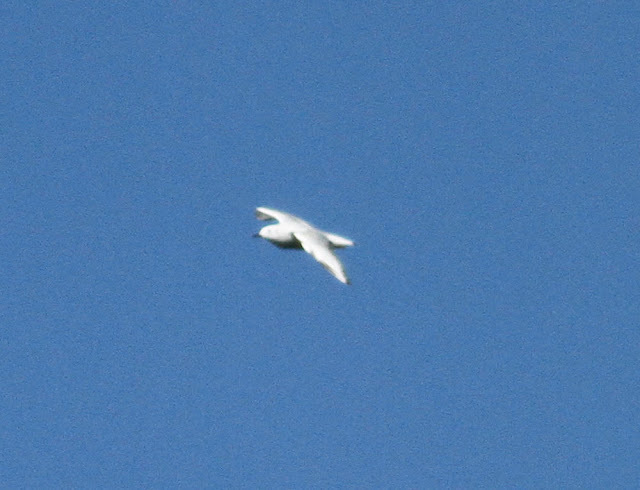 Distant bird, compounded by chronic auto-focus issues with the camera resulting in this fuzzy shot. Behaved like a migrant, gaining height and drifting off south a speed. Northern Harrier - juvenile, South Ferry Road, Montague, Franklin Co., MA. October 23rd, 2015. First noted by Josh Rose a few minutes before this sighting. Peregrine - juvenile, South Ferry Road, Montague, Franklin Co., MA. October 23rd, 2015. 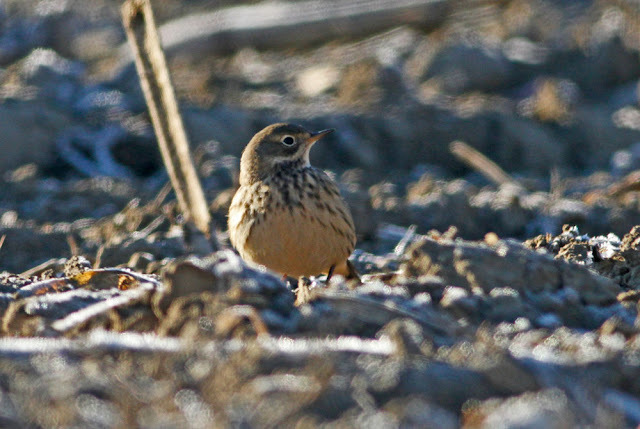 Rather thick-set, uniformly colored bird with weak moustacial and eye-stripe. White-crowned Sparrows - adult (right), first-winter (left), Unity Park, Turner's Falls, Franklin Co., MA. October 20th, 2015. Regular but not especially common migrant sparrow in late fall. This morning I made a quick check of Turner Falls airfield finding it relatively empty until I checked the eastern fence where a small concentration of birds included no less than 3 Winter Wrens, about 10 Field Sparrows and a Ruby-crowned Kinglet. 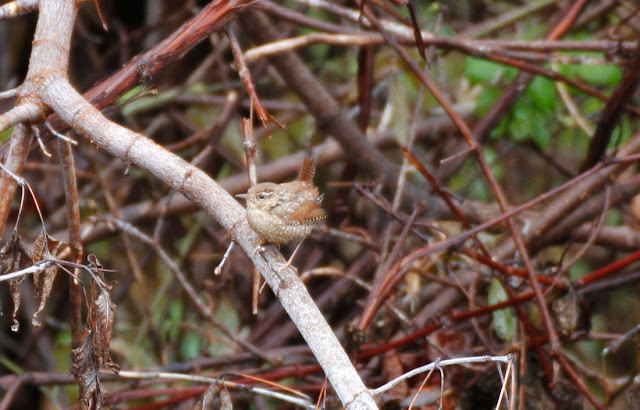 Winter Wren - Turner's Falls airfield, Franklin Co., MA. October 19th, 2015. 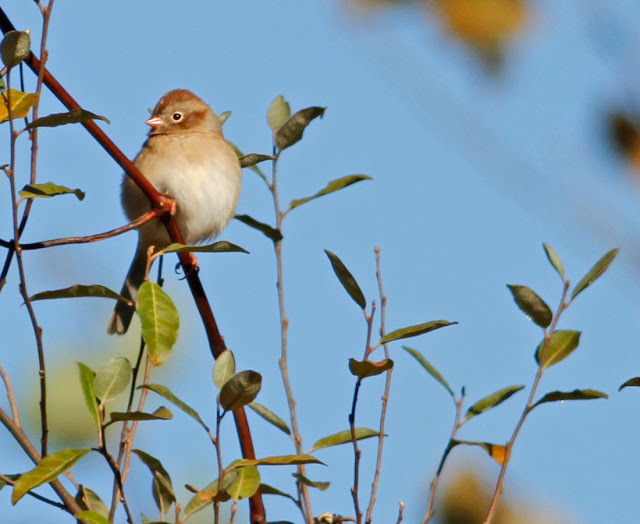 Field Sparrow - Turner's Falls airfield, Franklin Co., MA. October 19th, 2015. At least 10 concentrated along the airport fence. Cackling Goose - Turner's Falls power canal, Franklin Co., MA. October 19th, 2015. Apparently continuing bird from September 29th. 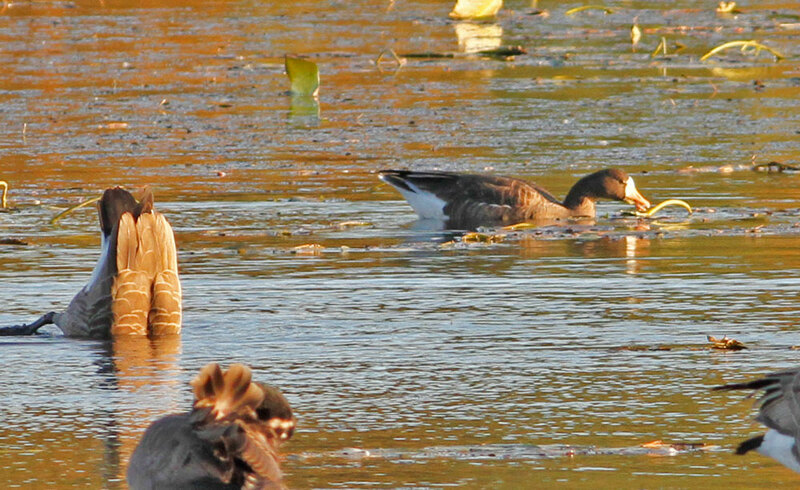 Greater White-fronted Goose (sub-species uncertain) - Turner's Falls power canal, Franklin Co., MA. October 19th, 2015. Probably continuing bird, first seen on October 5th. In the afternoon, the Turner's Falls power canal held about 450 Canada Geese which were not particularly easy to check due to wind and strongly contrasting light. However, a little effort revealed that the Cackling and the Greater White-fronted Geese were still present and giving good views. 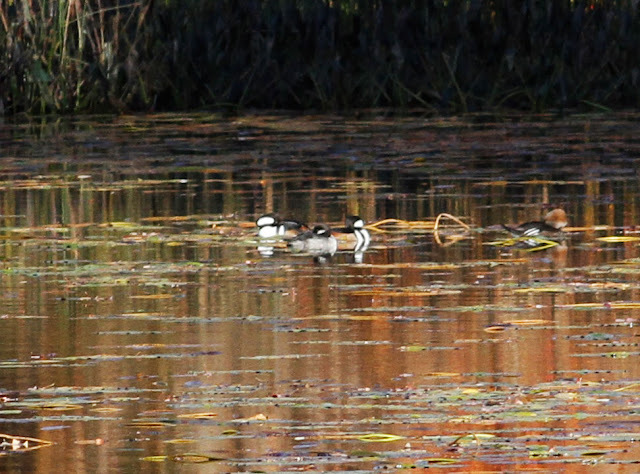 Hooded Mergansers numbered five, including a nice male. Classic late fall weekend with cold blustery conditions, snow flurries and the first genuine frost of the fall. 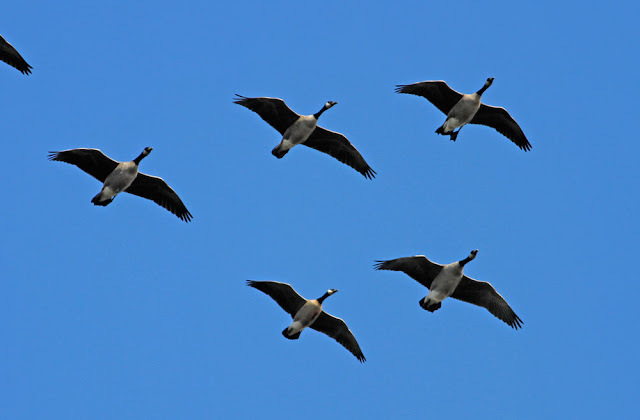 Didn't get to any dedicated birding this weekend but had some nice incidental observations, namely a flock 7 Brant heading WNW over North Cross Road, Gill moving ahead of some 350 Canada Geese, presumably flying out to the local fields to feed. An early morning visit to Upinngil Farm, Gill produced a nice flock of about 35 American Pipits feeding close to the road in a corn stubble field. 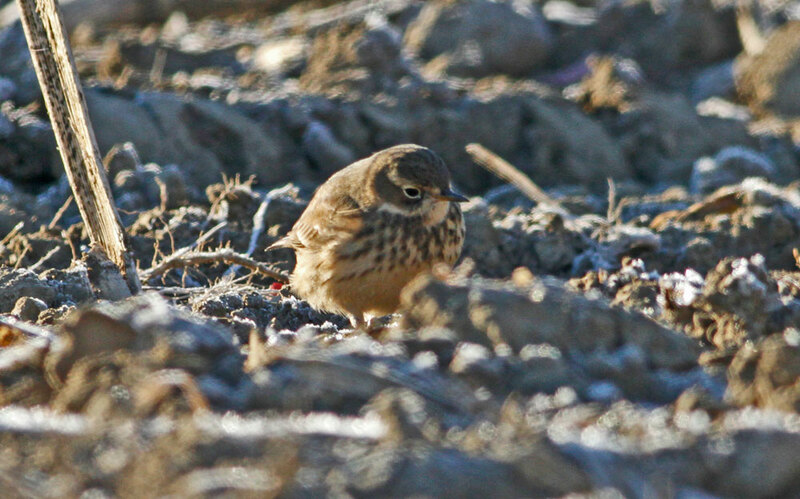 Although pipits are fairly regular on passage through the fields of Northfield, Gill and Montague they're often difficult to observe closely so this was a real treat! 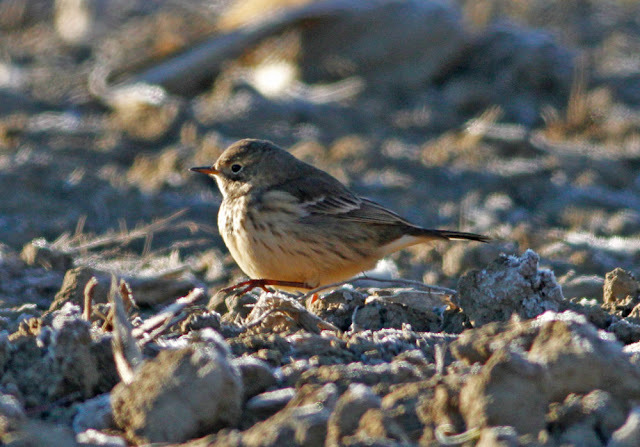 American (Buff-bellied) Pipit- Anthus rubescens rubescens. About 35 present in the fields across from Upinngil Farm, Gill, Franklin Co., MA. October 18th, 2015. Brant - Unity Park, Turner's Falls, Franklin Co., MA. October 16th, 2015. A surprise find in late afternoon. 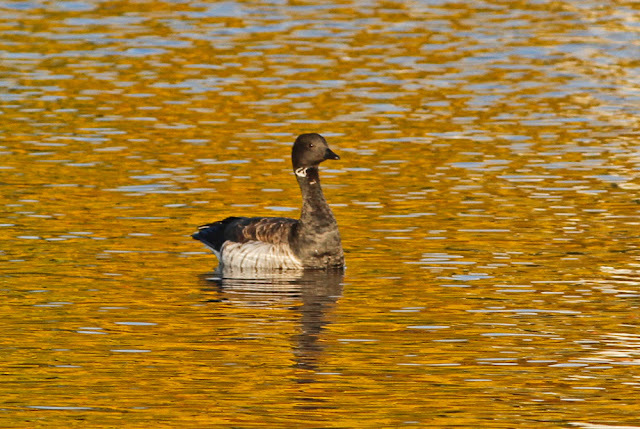 Brants are scarce late fall migrants through our area, usually lone birds just like this one. After running a few errands, I had a quick drive north through Turner's Falls in late afternoon. After a few minutes of scanning the power canal I soon located a Cackling Goose among 400 or so Canada Geese. Next stop was Unity Park where a Brant was a major but welcome surprise loosely associating with a handful of Canada Geese. On the north side of the river, a Greater White-fronted Goose was again present with a wide scatter of Canada Geese off Riverview Drive in Gill, along with three American Coots. That seemed like a nice haul of birds after an eerily quiet morning in which very little could be found, though I did see two different high-flying Northern Harriers over the power canal where a Cackling Goose (same as above) dropped in around 11am and apparently remained for most of the day. 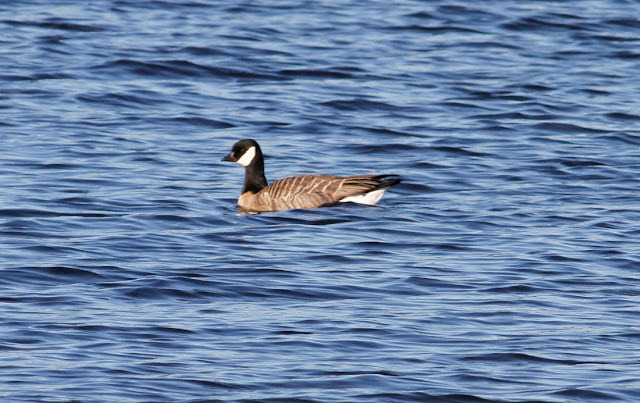 Cackling Goose (rear) - Turner's Falls power canal, Franklin Co., MA. October 16th, 2015. Cackling Goose (lowest bird) - arriving at Turner's Falls power canal, Franklin Co., MA. October 16th, 2015. Greater White-fronted Goose - Barton Cove, Gill, Franklin Co., MA. October 16th, 2015. Looks like the long staying, continuing bird. Northern Harrier - in migration, high over Turner's Falls power canal, Franklin Co., MA. October 16th, 2015. The second of two individuals this morning, about 35 minutes between birds. Another superb fall day, crisp, clear and a joy to be out admiring the New England foliage. Birding today was limited to a very quick 'sojourn' through Turner Falls around noon. 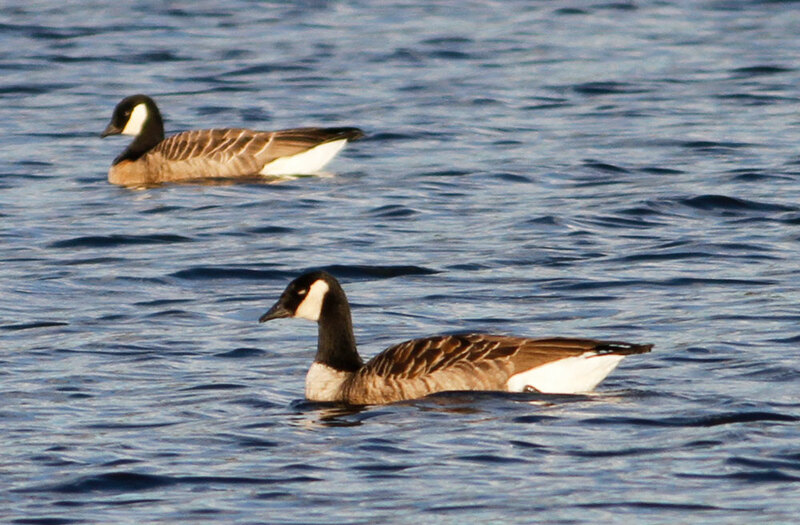 Good numbers of Canada Geese were present at both the power canal and Unity Park but alas, I couldn't pick out anything unusual among them. But, staring at the Canada Geese at Unity Park gave me my first Bonaparte's Gull of the fall as all the geese suddenly started looking skyward, eyes locked on the high-flying gull. 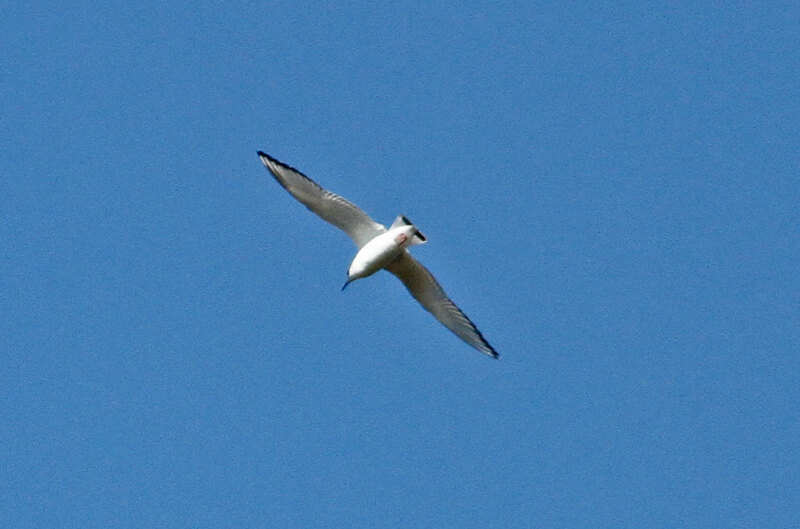 The Bonaparte's circled several times, apparently showing some interest in landing but then continued south leaving me to wonder how many really good birds must pass over the cove without being detected at all. 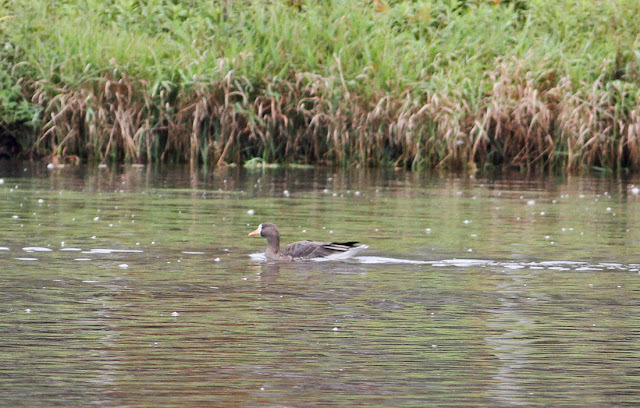 Had it not been for the Canada Geese, I might not have bothered to look skyward in that moment. Bonaparte's Gull - first-cycle, Unity Park, Turner's Falls, Franklin Co., MA. October 15th, 2015. 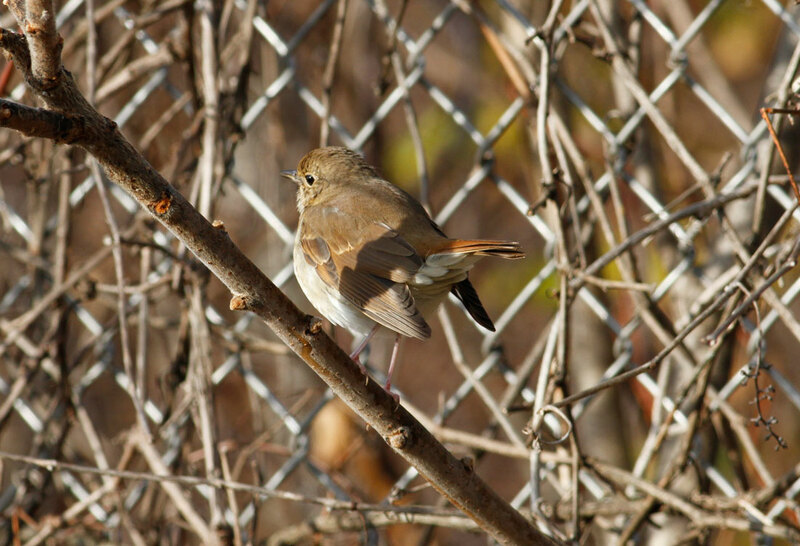 Quite scarce spring and autumn migrant through the Pioneer Valley. 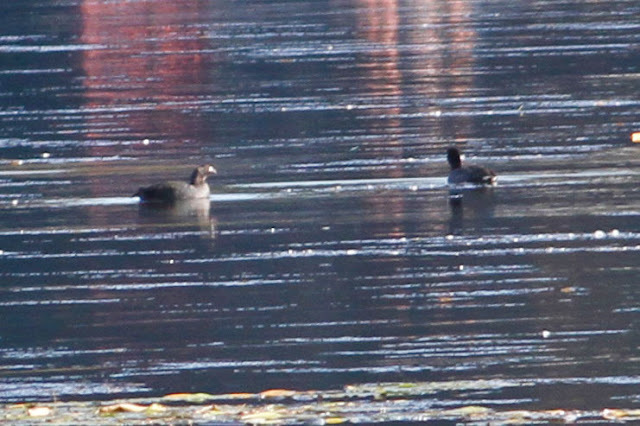 American Coots - Riverview Drive, Gill, Franklin Co., MA. October 15th, 2015. 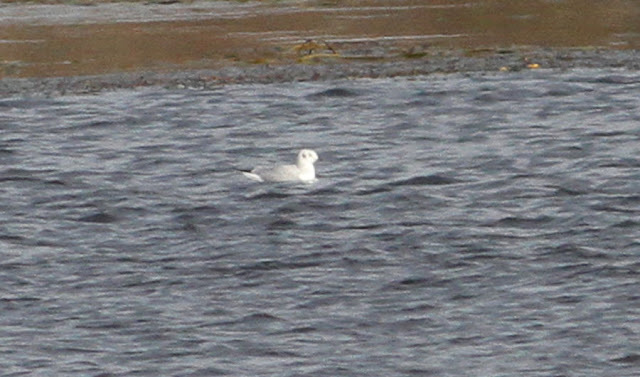 Only two remaining with three seen as recently as yesterday (10/14). Other than that, the American Coots were still on the Gill side of the cove but now numbered only two with the other presumably having been predated. 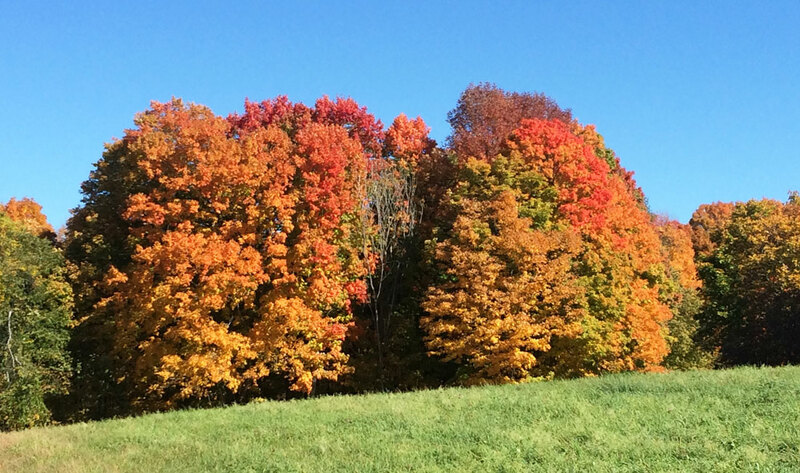 The local foliage display has been glorious this week with lots more to come! Main Road, Gill, Franklin Co., MA. October 15th, 2015.